With comics, candy, and superheroes, how can anyone go wrong? Popping colorfully off the pages of a comic book universe near you, the flavorful super-hero known only as Bat Pop is sure to sweeten up the streets with crime-busting hard punches as well as colorful hard candy for the law-abiding citizens! I might have set my own personal record for how many different programs I used to make this piece of rare digital art. 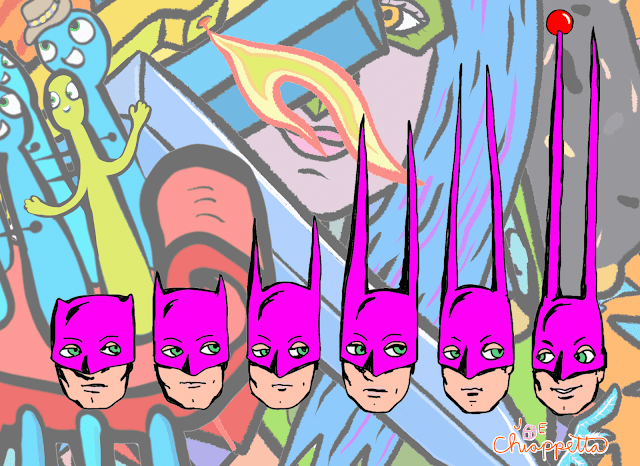 First I sketched a black and white version of the Bat Pop character on the Dada NYC online platform. Then I drew the cartoon-related background images on my iPad Pro with Apple Pencil in the Procreate app. Then I ran the background images through the composer on the Cryptographics site. As if these arts endeavors were not enough, then I colored the Bat Pop faces in my desktop Paint.net program and added the comic-themed background. Of course, between each step, I also fought crime. But that's another story.